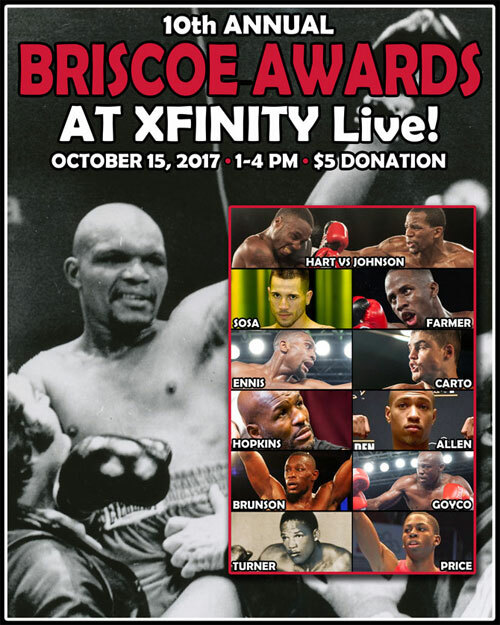 Philly Boxing History announced the winners of the 10th Annual Briscoe Awards, which will be presented on October 15, 2017, at Xfinity Live! in Philadelphia. The annual event is a celebration of the best accomplishments of the Philly fight scene. JASON SOSA, who won the WBA world junior lightweight championship and defended it later in the year, was named the “2016 Philly Fighter of the Year”. The “2016 Philly Fight of the Year” award will go to JESSE HART and DASHON JOHNSON, for their exciting super middleweight 10-rounder. Hart won the decision, but had to come off the floor to do it. Also one photographer’s individual work will be recognized as the “Photo of the Year” in an exhibit and contest held at the live event on October 15th. Former welterweight contender GIL TURNER, will be named the sixth honoree of Philly Boxing History’s Gravestone Program. For more information, including sponsorship and advertising opportunities, please call John DiSanto, 609-377-6413.